In today's world everyone is always ready to make money online on internet. The best way to make money is through blogging. Yes! you heard it right, I think blogging is that career which we consider as a life time investment. As we all know that ads are very important and play an vital role in the website. Advertising is one of the primary source of income for bloggers, and there are so many Ad companies which help you to earn money from your blog. The best is BuySellAds. BuySellAds are very choosy about the blogs they accept into their network. They deduct 25% from your ad sales. Well, lets focus on this article. This post is related with the best 10 BuySellAds alternatives via you can make money online. That concludes out list of top 10 alternatives of BuySellAds. If you have any better suggestion & alternative, then please leave a comment below. We are looking forward to your feedback. 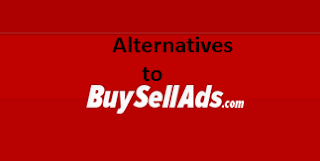 Your above list of BuySellads alternatives is really helpful for those bloggers who has rejected from BSA. They can get advantage of the above mentioned list. Thanks for it.